If you’re a citrus fan, pucker up! Calamansi lime marmalade is for you! It’s sweet, tangy and bright — exactly what you want to spread on an English muffin. This recipe makes 3 jars of citrus marmalade, so get out your canning tools. Like bottled sunshine, this stuff rocks. What Is A Calamansi Lime? Never heard of a calamansi lime before? I’m not surprised — they’re not commonplace here in the states, but if you can get them, they make wonderful ornamental plants that can soak up the sun in the summer time and come inside during the winter. And yes, they’ll produce fruit. Calamansi Lime is a hybrid citrus fruit, likely a cross between a kumquat and a mandarin orange. Calamansi goes by many monikers, including: calamondin orange, calamonding calamandarin, golden lime, Philippine lime, Panama orange, Chinese orange, musk orange, bitter-sweets and acid orange. They are a tiny citrus fruit, each one about the size of a walnut in its shell. They’re very fragrant and tart and they produce a lot of juice for the size of fruit. The skins are very thin, which make them perfect for this citrus marmalade — because you don’t have to go through the extra steps of blanching the peel to take away the bitterness, the way you would with larger citrus. My Mom has two of these citrus trees in her back yard — and I’m currently tending to two little bushes on my back patio. They produce A LOT of fruit — which practically begs to be used in calamondin pies and crinkle cookies, curds and cocktails. Or in this calamansi lime marmalade. This recipe makes about 3 jars of marmalade. You can make the marmalade and keep it refrigerated (gifting a jar or two to friends and family) or for long, shelf stable storage — can them. My family is big into canning. I’ve helped my Mom on numerous occasions and my Aunt Lynne is a whiz with her famous jams and jellies. That said, I’d never tackled canning on my own before. Undaunted, I purchased a set of canning tools and got busy with this citrus marmalade. I’ve included the canning instructions in this recipe. Wash and dry the calamansi. Slice the fruit in half, crosswise and remove the seeds. Juice the fruit. I use a hand held citrus juicer and squeeze it over a glass measuring cup. Use a sharp knife to cut the skins into thin strips. (My mother suggests pulsing it in a food processor to make short work of it) I did it the hard way, slicing each lime into strips. Add the juice, the skins and sugar to a large sauce pan to cook. Heat to a boil and cook for 15 minutes, then start to look for the signs that the marmalade is set. VISUAL CUES: Before you run a jam test, watch the bubbles on the surface. Bubbles will start out small and profuse, but become larger and less numerous as time progresses. TEMPERATURE: Use a candy thermometer and when the marmalade nearly reaches 220°F start to look for these other visual cues to confirm that it’s reached the gel stage. SHEETING: Stir the mixture with a wooden spoon. Lift the spoon from the liquid so that it’s horizontal to the pot. Gently tip the spoon (over the pot) towards you. The liquid will run off the spoon at first and then in individual drops. When two drops come together on the spoon and become one big drop, that’s sheeting and an indicator that the marmalade has reached gel stage. WRINKLE: This is probably the most common method for determining if you’ve reached the right consistency – but you have to be prepared for it by placing a small plate in the freezer ahead of time. When you want to test the marmalade, place a small spoonful of the marmalade on the frozen plate. Let it cool. Use your index finger and place it flat on the plate beside the pool of jam. Run the side of your finger (not the pointy end) flat into the marmalade. If it wrinkles, it’s ready. Canning pot – one large and deep enough to hold the jars and cover them with about 2 inches of water. Rack – for the bottom of the pot to keep the jars from sitting directly on the pot surface. (Note: I’ve also seen home cooks jury-rig a rack by using excess canning rings set in the bottom of the canning pot to elevate the jars over the bottom of the pot). Jar Lifter – so you can lift the jars out of the water bath. Canning Funnel – this is a wide-mouth funnel that makes it easy to fill the jars — smaller household funnels won’t work as well. The canning funnel makes it easy. Canning Spatula (or chopsticks) – to remove bubbles from the marmalade. Magnetic Top Lifter – the handy magnet makes retrieving lids and canning rings from hot water a snap. Dish towel (folded over once or twice) – to set the hot jars on after processing. This protects the jars from sudden temperature changes which can lead to breaking or shattering glass (setting a hot jar on a cold countertop will do that). Wash the jars, lids, and screw tops with warm soapy water. Arrange the screw tops on a clean towel, screw side down. Place the lids, bottom side down in a heat proof bowl. Put a canning rack in the bottom of your processing pot. Stack the jars upright on top of the rack and fill the jars and the pot with water to cover. Heat the water to just below a boil. This can take a while, but it doesn’t need to be watched closely. You’re heating the jars to prevent them from breaking when adding the hot marmalade. Use the jar tongs from your canning tools to lift the jars out of the hot water. Carefully drain the water back into the pot and use the wide mouth funnel to fill the jars with marmalade. Run the canning spatula around the rim of the marmalade to release any air bubbles that may be trapped. Use the jar magnet to retrieve the lids and place them directly on the tops of each jar. To break the magnetic seal, hold the lid down on the jar with the magnet and lean the jar magnet to 45° angle. Repeat with the other jar lids. Place the jars on a dish towel. Place the metal rings over the jars and twist just until the jar starts to twist on the dish towel. You don’t want to over-tighten. Place the jars in the pot of hot water (water should cover jars by about 2″) bring to a boil, then reduce heat so that it’s a very low boil. Process for 20 minutes. Turn off the heat. Let the marmalade jars rest in the pot for 5 minutes. 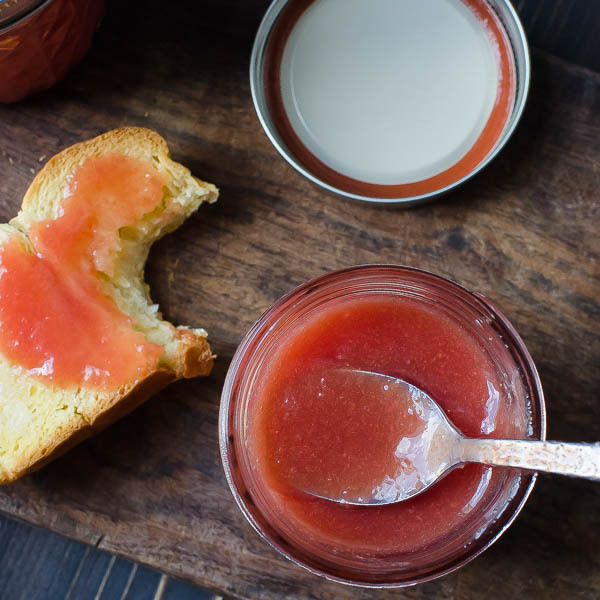 This lovely calamansi lime marmalade, is bright, citrusy and tart — exactly what you want with your English muffin on a dreary February morning to perk you up. Now that I’ve gotten my canning tools, I’m looking forward to more homemade jams, jellies and marmalades. I hope you are too! A simple, tart and tangy marmalade made with calamansi limes (also known as calamondin oranges). Preserve the bright, tart flavor, so you've always got some on hand. Despite the volume of calamondins, this recipe will make about 3, 8-oz jars of jam. That's because the calamondins are pretty tiny and their skins are really thin. In fact, it really depends on the size of the fruit you have as to how many calamondins you'll need. I used a combination of fruit from my tree as well as my Moms -- her's were about half the size as mine. Place the screw tops on a clean towel, screw side down. Place a rack in the bottom of your processing pot. (If you don't have a rack, you can place a layer of rings in the bottom of the pot. Stack the jars upright on top of the rack or rings and fill the jars and the pot with water to cover. Bring the pot to a boil. This can take a while, but it doesn't need to be watched closely. After I've put the jars on to boil, I start processing the fruit. Wash the calamondins well to remove any grit or residue. Slice the calamondins in half crosswise. Remove the seeds and discard. Juice the calamondins until you have 1 1/2 cups of juice and set the skins aside. Place a calamondin rind on a cutting board and flatten it out. Use a very sharp knife and slice the skins very thinly. Repeat this until you have about 3/4 cup of calamondin strips. In a large, heavy pan combine the calamondin juice, sliced rinds, water and sugar. Heat until the sugar is dissolved and bring to a boil, stirring occasionally. Reduce the heat to medium and continue to cook the mixture for 15 minutes. Then start to watch for "the signs" that it's done. VISUAL CUES: Before you run a jam test, watch the bubbles on the surface. They get bigger as the jam approaches its gel stage. They start out small and profuse, but become less numerous as time progresses. TEMPERATURE: Use a candy thermometer and When it nearly reaches 220°F start to look for these other visual cues to confirm that it's reached the gel stage. SHEETING: Stir the mixture with a wooden spoon. Lift the spoon from the liquid so that it's horizontal to the pot. Gently tip the spoon (over the pot) towards you. The liquid will run off the spoon at first and then in individual drops. When two drops come together on the spoon and become one big drop, that's sheeting and an indicator that the marmalade has reached gel stage. WRINKLE: This is probably the most common method for determining if you've reached the right consistency - but you have to be prepared for it by placing a small plate in the freezer ahead of time. When you want to test the marmalade, place a small spoonful of the marmalade on the frozen plate. Let it cool. Use your index finger and place it flat on the plate beside the pool of jam. Run your finger on the plate sideways into the jam. If the jam starts to wrinkle like a Shar Pei puppy, it's ready. Remove the marmalade from the heat. Use the canning tongs to pick up a jar from the pot. Carefully tilt the jar over the pot to drain the water. Place the jar on a dish towel. Repeat with the remaining jars. Divide the marmalade between each of the jars using a canning funnel to pour the marmalade without spilling. Use the canning spatula or a pair of chopsticks and run them around the rim of the jar to free any air pockets trapped in the marmalade. Using your fingertips (and not touching the interior threads, screw the lids into place. Don't hold the jar while you're doing this -- you don't want a tight seal. Just use your fingertips to screw the lid onto the jar. When the jar starts to turn on the dish towel, it's tight enough. Use the canning tongs to lift each jar individual so that they are always upright and not tilted. Transfer the jars directly to the pot of hot water and rest on the rack. The water should cover the jars by about two inches. Bring to a boil. Once the water starts to boil, reduce heat to a lower boil -- but still boiling. Process for 20 minutes. When the marmalade has processed, let it rest in the pot for 5 minutes, then use your canning tongs to carefully lift each jar out of the pot and transfer to the dish towel. If the jars are processed correctly, you'll hear a little "POP" come from each jar a few seconds after it's been removed from the pot. When it cools, remove the twist on lid and use a clean towel to dry them. Replace the lid and tighten. Let the marmalade rest for 24 hours. Then use, store or gift as you like. Pin Calamansi Lime Marmalade For Later! LOVE limes, but have NEVER heard of this kind. This looks totally delicious and would love to slather it on some homemade scones. I wish we had these limes. Sometimes we are lucky to see kefir limes. I will keep an eye out…just in case. You may be able to find them in an Asian or Philippine market. What I would do to get my hands on some calamondin oranges. We used to have these trees in our yard when we lived in Florida. They are the tastiest fruit and ideal in marmalade. This looks wonderful and I am envious of you. I am fortunate to have two calamondin bushes in my back yard. I say bushes, because they’ve not quite grown to “tree status” yet. Marmalade on toast is one of my favourite things to have for breakfast. I am going to have to try your recipe. I’m not sure I’ve ever seen this citrus, but if I manage to find it, this is definitely up there to try. I haven’t had marmalade in a while, but a tarter version sounds so up my street and the color of the fruit is so pretty too. Yum! Thanks, Caroline! If I have extra, I’ll send some your way! I’ve never heard of calamansi limes before, but I love marmalade and this looks delicious! Making fruit preserves and canning is such a fun process. I’ll be on the lookout for calamansi limes to give this a try!